Albinism is a very rare genetic condition that causes the body to be unable to, or have limited ability to produce melanin which is responsible for the colouring in skin, hair and eyes. This leads to a snow white complexion and extremely fair hair, but also a more serious impact. Most people with albinism experience vision impairment, or complete blindness. 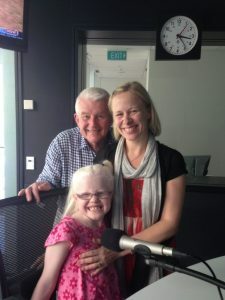 Meet Rachel Perry and her daughter Zara who is seven and is living with albinism. They generously came in to share their story and help bring Albinism into the light. For more information visit the Albinism Fellowship of Australia website.